To ensure that e-learning days went smoothly on bad-weather days, Maconaquah School Corp. schools practiced using online learning tools on good-weather days, says Judy Off. In Maconaquah School Corp., snow days and school cancellations are no longer synonymous. After a tough winter forced the Bunker Hill, Ind., district to shut its four schools for 12 days in January and February, district officials decided to turn ensuing snow days into e-learning days. "We had four snow days during which we did e-learning, from home," says Technology Director Judy Off. Teachers created interactive, online lessons for students; some even used video conferencing software to deliver live lectures. For some classes, students worked on assignments independently and submitted homework to teachers online. In others, students collaborated on projects using Google Docs or had discussions with classmates and teachers via online forums. Maconaquah School Corp. is one of many districts that have developed a continuity of learning strategy so students can continue to learn when their schools are forced to close because of winter weather, natural disasters, disease outbreaks or other circumstances. Such programs offer numerous benefits. Districts don't have to make up for lost time by adding more school days at the end of the school year. They also allow students to stay on track academically if they can't physically attend classes for health or other reasons. "The technology exists, and if we're not leveraging online learning in these types of circumstances, it's a missed opportunity," says Dr. Leanna Archambault, associate professor in the Mary Lou Fulton Teachers College at Arizona State University. Many schools realized they needed a learning continuity strategy during the H1N1 flu pandemic in 2009. The severe snowstorms across the Midwest and Northeast last winter sparked renewed interest in using virtual learning as an alternative to snow days, says Dr. Allison Powell, vice president of new learning models and state and district services for the International Association for K–12 Online Learning. "A lot of schools are talking about it again," Powell says. "More schools have online learning in place now, so continuity of learning is becoming more real across the United States." 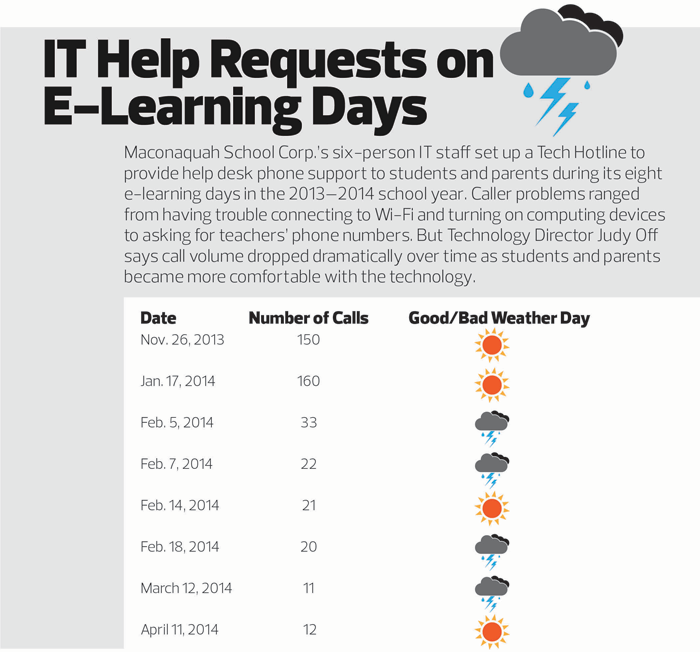 When the number of weather-related school closings extended beyond two weeks this past winter, the Indiana Department of Education allowed Maconaquah School Corp. to try e-learning because the district "already had everything in place to do it," Off says, noting that students are accustomed to logging in to Maconaquah's learning management system to access online educational materials, such as videos and websites, and submitting their homework online. "We're using digital content as part of our regular curriculum, so it wasn't a real stretch for us to do that on a snow day," she adds. Maconaquah built the foundation for virtual learning during the 2010–2011 school year, when it launched an initiative to equip third- through 12th-grade students with Lenovo notebook computers and K–2 students with tablets. District officials also installed Wi-Fi and modern classroom technologies, such as interactive whiteboards and document cameras, at each school and migrated from print textbooks to a digital curriculum. More recently, the DOE gave the district a grant to experiment with online learning and flexible schedules. For the 2013–2014 school year, district officials scheduled four e-learning days unrelated to inclement weather. In preparation, the IT department trained teachers how to develop online lessons and leverage e-learning tools. Ron Shaffer, a math teacher at Maconaquah Middle School, says e-learning days require an enormous amount of preparation by teachers to make sure they give students an authentic learning experience. "We have to make sure links for websites are still good," he says. "We have to anticipate questions. And we have to always be available via email, video chat or a phone call." During the first e-learning day in November, Maconaquah Middle School teachers collaborated on a multidisciplinary online learning activity inspired by the TV show The Amazing Race. Students traversed the globe via the web, doing math problems (determining the distance and travel time between cities), social studies (taking virtual tours of museums and other attractions) and writing (blogging about their experiences for English class), Shaffer says. Beginning in February, when snow days became e-learning days, teachers designed lessons that offered a mix of online and offline activities. One day, Shaffer recorded a video lecture and posted it to the LMS. "They watched it and then did an assignment," he explains. The e-learning days were so successful that district officials plan to ask the DOE if they can use e-learning days for all weather-related cancellations next school year. "It's good practice for the real world," Off says. The Michigan Department of Education currently doesn't allow public schools to use distance learning to replace snow days. But individual districts do have continuity of learning policies in place that allow individual students to learn online if they have an illness or need to be out of the classroom for an extended period of time, says Anupam Chugh, an instructional technology consultant with the Wayne County Regional Educational Service Agency. Chugh, who trains area schools in continuity of learning, knows the benefits firsthand. Last fall, her 8-year-old son had an illness that required him to be out of school for six weeks. Fortunately, administrators at Plymouth–Canton Community Schools in Plymouth, Mich., allowed him to video conference into his second-grade classroom every day using Skype. The teacher placed a district-supplied notebook computer on her desk and pointed the webcam toward herself when she lectured, allowing Chugh's son to watch from home with a tablet. The teacher and his classmates made sure Chugh's son was involved in classroom activities every day. "He felt as if he were part of the classroom," she says. "When he went back to school, he didn't feel like he missed the classroom experience." In some Michigan districts, teachers record lectures on interactive whiteboards and post them to an LMS. Absent children can log in, view the lecture, access reading materials and then do their assignments. In those cases, she adds, "students can continue to learn rather than worrying about being behind in school." Maconaquah School Corp. provides each student with a mobile computing device. But before embarking on its first e-learning day, the four-school district in Bunker Hill, Ind., also needed to make sure every student had Internet access at home. Administrators surveyed students and discovered that 85 percent had Internet access. For the remaining 15 percent, the district struck a deal with a local wireless Internet service provider to give those students free Internet access, says Technology Director Judy Off. The district allowed the service provider to place wireless equipment on school property in order to extend its service area to that neighborhood. In exchange, the provider agreed to provide free Internet access to students who needed it, she explains. Even so, some students in rural areas still couldn't get Internet access. When there was a threat of snow the next day, teachers provided those students with paper copies of learning materials and had them download materials they needed from the learning management system before going home, Off says. Other schools, including the Thomas Jefferson High School for Science and Technology — known as "TJ" — in Alexandria, Va., offer virtual learning for the sake of convenience. Some students spend three hours commuting by bus to and from school every day, explains Principal Evan Glazer. On "early release" school days, they might spend more time on the bus than in class. So starting in 2010, the school allowed students to stay at home and learn online on those days. "It was meant to make the most out of the school day when we have abbreviated days," he says. The school also has used "telelearn" days to ease teachers' schedules for professional development and back-to-school nights. Traditionally, students are granted a day off at the end of each quarter so teachers can finalize grades and prepare their curriculum for the next quarter. But in April, school officials turned the holiday into a telelearn day to make up for one of the 11 snow-related school cancellations that occurred over the winter. "Telelearn days create flexibility in our schedules in order to maximize output for different circumstances," Glazer says. TJ generally holds three telelearn days a year, but Glazer will increase that number for the 2014–2015 school year to accommodate ongoing construction projects at the school. directed activities in one day because it feels like a day of homework. Still, most in the TJ community understand the value of telelearn days, he adds. In addition to providing scheduling flexibility, virtual learning allows students to practice skills they'll need in the future. "Students need exposure to self-directed activities and practice managing their time. That's expected of them when they reach the workforce," Glazer explains. "With these mini experiences, it enables them to demonstrate their ability to be productive without someone looking over their shoulder." To have a successful e-learning or "telelearn" day, school administrators must give teachers time to prepare good online lessons, says Evan Glazer, principal of the Thomas Jefferson High School for Science and Technology in Alexandria, Va.
As such, school officials try to schedule telelearn days at least one month in advance to give teachers time to develop their lessons. "It takes a lot of instructional preparation to give students meaningful learning activities that maintain momentum and adhere to learning objectives," Glazer says. All assignments are meant to be completed within a traditional 40-minute class period, he adds. The school uses a learning management system to share resources, such as educational videos, podcasts and online reading materials. Some humanities students read literary passages and discuss them with their classmates and teachers via online discussion boards. And some teachers use the system to create online assessments. But not every assignment is technology-based. Students do some hands-on lab activities at home and write papers that they then submit to teachers online, Glazer says.